Here is a sexier version of the test project mixing iTween and AStar tools (see first post about it). iTween configuration has been tweaked to fit a more realistic trajectory (player’s orientation is better than previous version but still not totally satisfying). See iTween.MoveTo method’s documentation for more details about parameters. Try the Web Player version (4.4 Mo) and/or download the project sources (24.6 Mo). 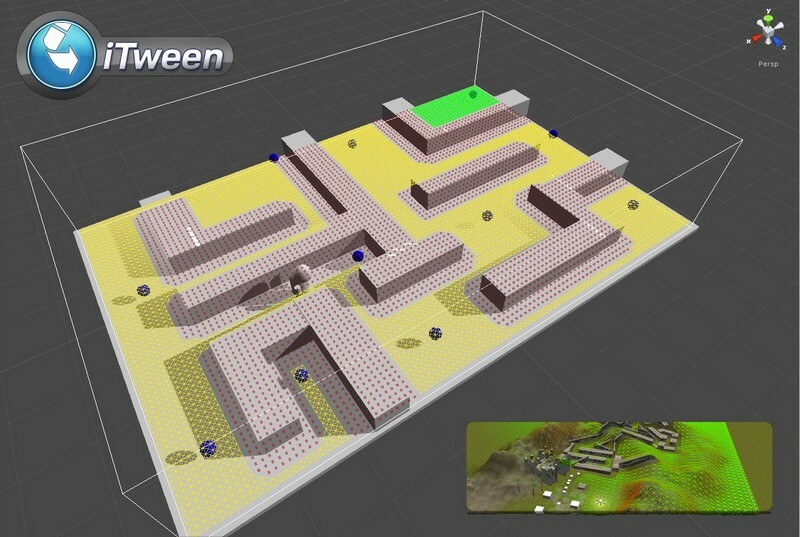 When pixelplacement’s iTween meets Aron Granberg’s A* Pathfinding, you get a quick demo of what you can achieve with powerful and easy to use tools. With just 2 little scripts (basically 2 function calls, one for each tool), I easily managed to set a typical path finding system. Try the Web Player version (86 Ko). And here is the project sources (1.5 Mo). Check comments in the Player.cs and KeyPoint.cs scripts for more details about this implementation.